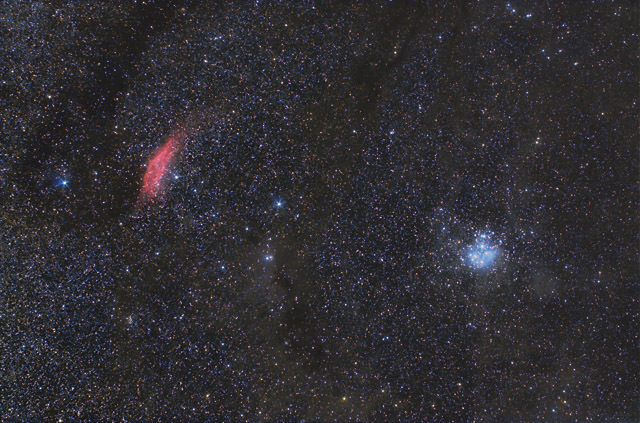 From Perseus to Taurus, this image shows the red hydrogen emission nebula "California Nebula" (NGC 1499) as well as a very contrasting blue "Pleiades" reflection nebula (M45). This field of view also contains a wonderful collection of dust clouds, and these can be seen as brown and dark regions throughout the star field. Software Used Images Plus 5.0 for camera control, calibration, stacking, digital development, star shrinking, smoothing and noise reduction. Photoshop CS5 used for levels and curves, color correction, selective color, high pass filter, lab color, saturation adjustments, and screen mask invert. Gradient Xterminator for gradient removal. Carboni Tools for additional saturation adjustments, noise reduction, and smoothing. HLVG for additional color correction. Notes I had wanted to put in more time on this image as well as add some hydrogen alpha data. But, time ran out, and I was shipping my mount for some maintenance. So, I decided to process it with the more limited data that I already had. I'm reasonably happy with the final result, even though I think the additional data could have helped. This image won 1st place in Astrophotogallery.org's January 2013 "Widefield" category. This image was also selected by Astronomy Magazine for its Picture of the Day for February 27, 2013!